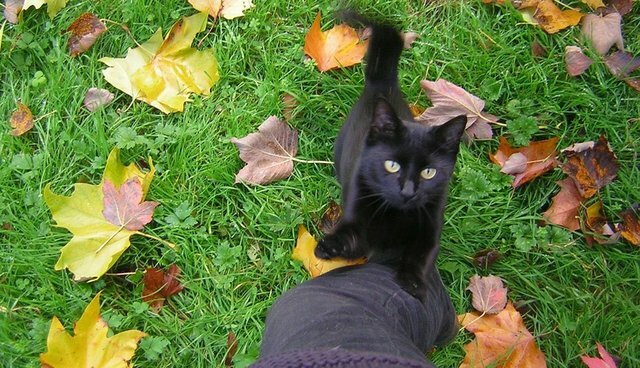 Ruby Murphy thought her adopted cat, Priscilla, was lost and gone forever when she disappeared from Murphy's yard in 2009. The cat, who spent much of her time outdoors, would occasionally go away for a couple of days at a time, but when she went missing for more than a week, Murphy assumed Priscilla might have been killed. Then, a few weeks ago, the now elderly cat showed her former owner what happens when you assume -- she walked up to Murphy at a bus stop, alive and well as ever. "I saw her perched on a neighbor's wall," Murphy told HLN. "I called her like I used to, and she whipped around and came trotting up, meowing and rubbing her head on my feet... I beckoned her into my house, to show my family, who were all so happy!" After bringing Priscilla home, Murphy discovered that a woman down the road had been caring for the cat, and she decided that the two might be better for one another. "We [Priscilla and I] had a connection that never went away," Murphy said. "But we think the woman and Priscilla are both happy how they are, so we are leaving things as they are!" Murphy said that even though she won't be keeping her cat, it's nice to know she's happy and doing well.